A recent poll by a Ukrainian research group shows how unhappy the country is with their politicians. Only eight percent say the country is going in the right direction, while almost two-thirds assert they don’t approve of the president’s actions. The figures should make for worrying viewing for President Petro Poroshenko and his government as Ukraine is currently mired in economic turmoil and political instability. A poll carried out by the Kiev-based Research & Branding Group from March 6-16, shows just how fed-up Ukrainians are with the way their country is being run. Poroshenko may have been in power for just over nine months, but it would appear his ‘honeymoon’ period has well and truly ended. Just a third of those asked believe he is doing a good job, while almost 60 percent say they aren’t happy with the way the billionaire is running the country. If elections were carried out today, just under 20 percent of Ukrainians would back Poroshenko, while 30 percent would either vote against every candidate or not bother going to the polls. However, Poroshenko seems to be getting off lightly. Ukraine’s nationalist Prime Minister Arseny Yatsenyuk is even less popular with less than a quarter of those surveyed believing he is doing a good job in helping to run the country. The Ukrainian media has repeatedly been reporting stories of how thousands of Russian troops are supposed to be helping anti-government militia’s in the east of the country in their fight against Ukrainian government forces. But the vast majority of those asked think their media and the stories they produce are untrustworthy, with almost 60 percent not believing the stories published and broadcast by the Ukrainian press. 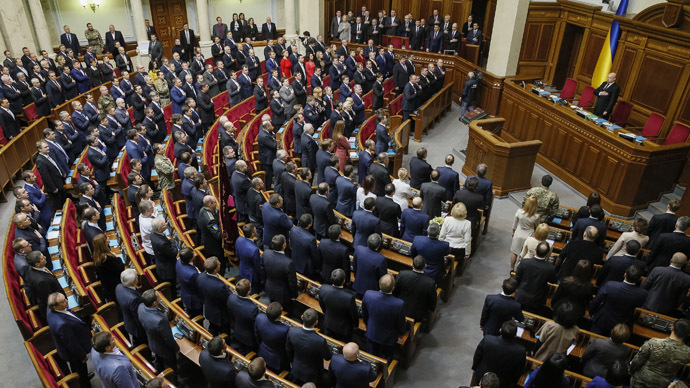 The most damaging statistics for the Ukrainian government show that a meager eight percent say they are happy with the direction their country is taking and only five percent say Ukraine is politically stable. The hryvnia has lost more than half its value during 2015, while the weakening currency has led to massive inflation, which has reached 272 percent by some estimates. Despite receiving a $5-billion loan from the IMF on March 13, which is the first tranche of a $17.5-billion loan from the organization, the country’s Finance Minister Natalie Jaresko says it’s not enough and the country needs more funds from the West. “The package that we have is going to stabilize the financial banking system, but it’s not enough to seriously restart growth and promote growth,” said Jaresko after a meeting with US Treasury Secretary Jack Lew on March 16. "I'm looking for more support," she added. The poll was carried out across all regions in Ukraine, apart from the Donetsk and Lugansk regions. A total of 1,501 adults were surveyed, while the Research & Branding Group, which is a non-governmental marketing and sociological research company said there was a three-percent margin of error.